The Order of the Pelican is one of the four SCA Bestowed Peerages, along with the Order of Chivalry, the Order of the Laurel, and the Order of Defense. Companions of the Order of the Pelican (or 'Pelicans') have been recognized by the Crown for their exemplary service to the Kingdom and/or the Society, along with their consistent display of the virtues of Grace, Courtesy and Chivalric Demeanor. Their elevation is accompanied by a Patent of Arms (the highest level of arms). Generally, the Pelican candidate's service is long-term, on-going, and has made a great difference to other members of the SCA. They can have rendered such service by running events, holding offices, or assisting with the organizational aspects of their local or regional group, their Kingdom, or the Society as a whole. been obedient to the governing documents of the Society and the laws of the kingdom. consistently shown respect for the Crown of the kingdom. set an example of courteous and noble behavior suitable to a peer of the realm. demonstrated support for the aims and ideals of the Society by being authentic in dress, equipment and behavior as is within their power. shared their knowledge and skills with others. practiced hospitality according to their means and as appropriate to the circumstances. made every effort to learn and practice those skills desirable at and worthy of a civilized court. To this end they should have some knowledge of a wide range of period forms, including but not limited to literature, dancing, music, heraldry, and chess, and they should have some familiarity with combat as practiced in the Society. participated in Society re-creations of several aspects of the culture of the Middle Ages and Renaissance." setting an example of courtesy and chivalrous conduct. respecting the Crown of the kingdom; supporting and upholding the laws of the kingdom and the governing documents of the Society. (if the member has sworn fealty to the Crown) supporting and upholding the Crown of his or her kingdom. enriching the kingdom by sharing his or her knowledge and skills. advising the Crown on the advancement of candidates for the Pelican. 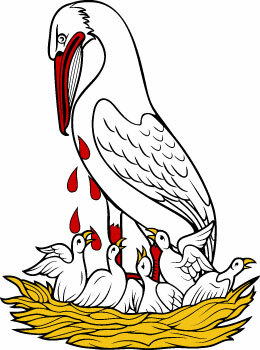 The heraldic symbol of the Order of the Pelican is 'A Pelican in her piety' - that is, piercing her breast with her beak to feed her chicks with her own blood. Some members also wear a brimless round hat trimmed with fur and/or banded with white feathers, called a Cap of Maintenance. As Knights may take on squires, Pelicans may take on dependents known as 'Protegés'. The Order of the Pelican was established in 1972 by the SCA Board of Directors. It was initially intended to be awarded by the Board to honor service to the central organization of the SCA. In 1974, Corpora included both the "Imperial" Pelicans, and a version awarded by the Kingdoms. By 1977 the Board had ceased giving the award. This page was last edited on 13 April 2016, at 16:21.